This Halloween, let your kid show off their undying, unquenchable dedication to the food they ask for every... single... weekend. The food that they would eat every single day if they could get away with it (and if you didn't care about their diet as much as you do). We're talking about pizza, of course, which may be the very king of all foods! You can do almost anything with it (around here we prefer to eat it), and everyone loves it... especially your kid. That's why this awesome Kids Pizza Slice Costume is the perfect match for your little pizza lover this Halloween! This slice of pizza is what we call the "classic combo." The toppings are cheese, pepperoni, and mushroom, and it's baked to a rich, crisp and delicious golden brown for undeniable quality! It's the perfect representation of America's favorite food, and we're pretty sure your kid will be able to deliver it in 30 minutes or less to every single house in the neighborhood on Halloween night. Because, let's face it: a giant slice of pie and a bag of candy are a match made in Halloween heaven. 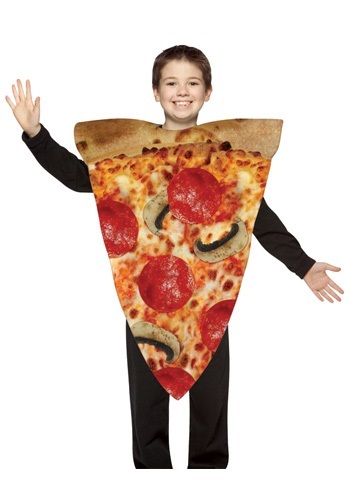 Unlike real pizza, though, no actual prep or cooking is required to enjoy the Kids Pizza Slice Costume! Heck, you don't even have to preheat your oven! All you have to do is slip on this one-piece polyfoam tunic, and you're ready to go!